Video on Demand is a system that allows your customers to rent, purchase, and subscribe to pre-recorded videos from your store and watch the videos whenever they want. To edit your video on demand default settings, navigate to your Yondo Store Management Page; and under the "Video on Demand section, in the let-side navigation bar, select "VOD Settings". Next, set your default rental price for videos across the entire store. Check "Free" if you will not charge for rentals. Your subscription pricing will be connected to all of your subscription videos. Customers who sign-up for a subscription, will pay you a recurring payment every month. You can also set your subscription to $0.00 if you only want to collect contact information from your customers for future marketing opportunities. Help Link (Optional) - You can add a link to offer explanations of the rental or subscription price to your customers. This is displayed on the video player after finishing the preview. After completing these steps, click the "Save changes" button at the bottom right corner of the page to save your Video on Demand settings. To begin, navigate to your Yondo Store Management Interface and select "Video On Demand", on the left side navigation bar. To upload a video, click the "Add my videos" button in the middle of the page (or at the top right, if there are videos already added. Upload your new video file - Drag and drop your file or use the "Choose file" button to seect a video from your computer. Depending on the size of your video and the speed of your Internet connection, your video may take just a few minutes to upload or much longer; if the file is large or you are using a slower connection. The next step is the Video Encoding Process.- This is a process of converting uploaded videos into a digital format that is compatible with the Yondo web player. This system will also create a thumbnail from the uploaded video. This process may also take some time, depending on the size of your video file. Click the video you want to edit. Title. this is the name of a video, it gives customers a brief explanation of the video. Publisher (Optional). This is "Who" created the video. Description. This is displayed on a video's page and helps customers understand what the video represents. Tags (Optional). A tag is a keyword that helps your customers identify a video. Upload a Thumbnail (Optional). The thumbnail is the image that will be displayed on your listing card. A thumbnail is automatically generated during the encoding of a video. If desired, a custom thumbnail of your choice can be uploaded. Upload Preview video (Optional). The Preview will be shown to customers who have not rented or subscribed to your video. Attach a file to your video listing if you need to. Publish. If you check publish, the video will be shown to the public. How would you like your customers to access this video? You can sell your videos on a monthly subscription basis, timed rental, one time purchase, or any combination of the three. A timed rental is similar to a pay-per-view movie. Check the Rental option if you want to make the video available as a rental. You can optionally Enter a special rental price. This allows you to set up a specific rental price for a certain video. If you do not enter this, your default rental price will be applied. You can also check "Free" if you want to make the video freely available. The Purchase pricing will set a price for your customer to pay, so that they may gain access to the video indefinitely. Check the Purchase option to "On" and you will be required to add a purchase price to your video. There is no default pricing with this option so you will not be able to leave the pricing field blank. Check the Subscription option if you want to make the video available to your subscribed customers. Once you have added you video and price you can also add your video to your Playlists right from your Edit Video Screen by using the Playlists Tab. Just click 'Add to Playlist' and choose the Playlists you would like to add to your video too. To learn more about the Playlist function of Yondo, please refer to our support article on Creating Your Video Playlist. 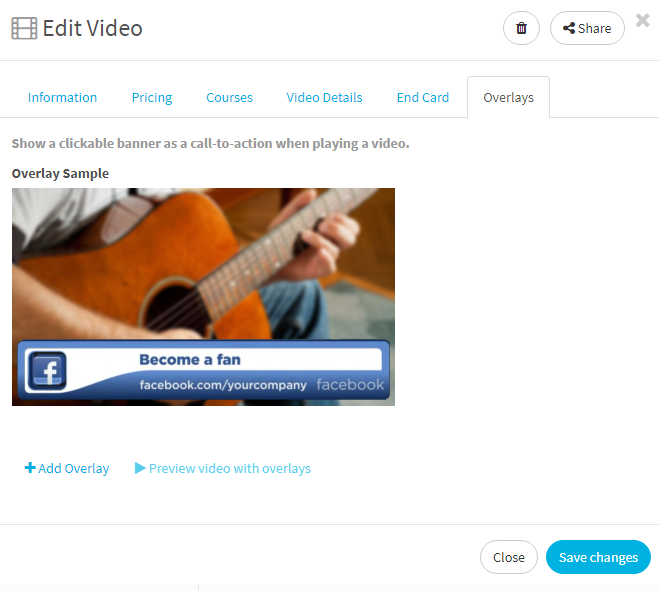 In the End Card section of your Edit Video Screen, you can add a clickable Call-to-Action to appear on the ending of your video, to further promote business. To Add your end card click on the "End Card" tab. 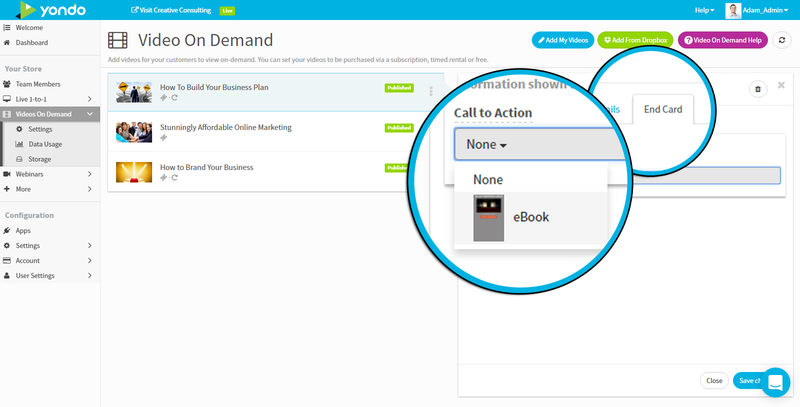 Here you will choose which Call-To-Action panel you would like to add to your video. If you would like to learn more about how to create a Call to Action panel, Please refer to our guide on How Do I Create A Call To Action Panel. A video overlay is an image or animation that you can add to your videos which will appear on the bottom of the video screen over the video. These images can be used as titles within your videos or even as a clickable call to action. Once these steps have been completed, click the "Save Changes" button at the bottom right corner of the page to save your video.